Beef, Salmon, Chicken, Tuna With the choice of beef, salmon, chicken or tuna, your senior cat is sure to enjoy mealtime even more! Our delicious FELIX®As Good As It Looks Senior Cat Mixed Selection in Jelly provides essential support to your senior cat, keeping his healthy and active in his senior years, Purina vets and nutritionists have specially formulated FELIX®As Good As It Looks Senior Cat Mixed Selection in Jelly to include essential nutrients your cat needs, and our recipes are a great way to meet the dietary requirements of your cat, whilst providing his with lots of delicious flavours he will love. Packed with all the flavours your cat will enjoy. We include minerals and vitamins D & E to keep your cat supported. Our cat food is great for senior cats that need caring for in their later years. 12 assorted meals served in individual pouches for convenience. Complete cat food to support your senior cat as he grows older. 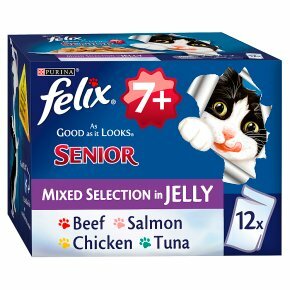 With the choice of beef, salmon, chicken or tuna, your senior cat is sure to enjoy mealtime even more! Our delicious FELIX® As Good As It Looks Senior Cat Mixed Selection in Jelly provides essential support to your senior cat, keeping his healthy and active in his senior years, Purina vets and nutritionists have specially formulated FELIX® As Good As It Looks Senior Cat Mixed Selection in Jelly to include essential nutrients your cat needs, and our recipes are a great way to meet the dietary requirements of your cat, whilst providing his with lots of delicious flavours he will love. Our recipes are specially formulated for cats of age 7+ to help keep them healthy. We pack our pouches with lots of irresistible ingredients and flavours including beef, salmon, chicken and tuna. 100% complete and balanced nutrition for your senior cat. Served in individual pouches for convenience - a great way to serve your cat every mealtime. Feeding guide for an average adult cat (4kg) 3 pouches per day in at least 2 separate meals Serve at room temperature. Clean, fresh drinking water should always be available. The adult maintenance averages are based on moderately active cats at normal environmental temperatures. Individual needs vary and feeding should be adjusted as required to maintain your cat at a lean, healthy body weight.